Special Holy Family Blessing over all families today! 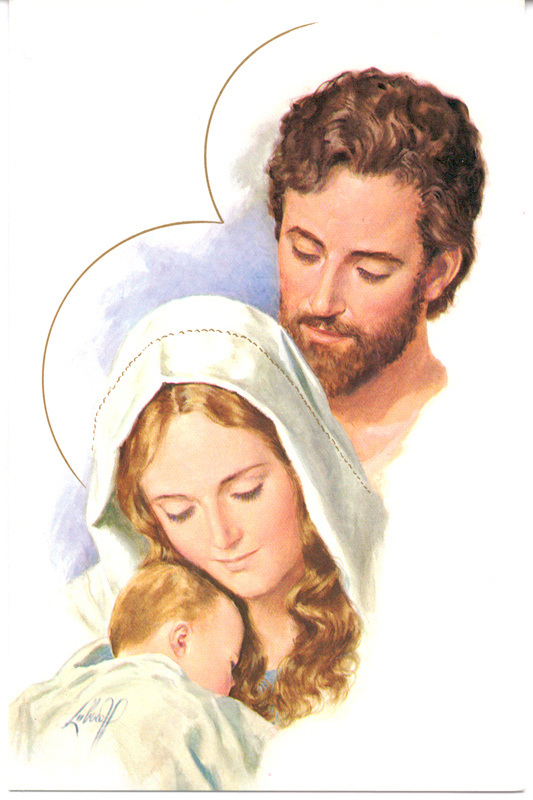 Message--How Do We Have a Holy Family? Children's Church: Hands on Learning, Loving and Safe Teachers, Changed Lives! There are two pillars of our Christian society responsible for the common good and the welfare of our people. In recent years, both of these pillars have come under demonic attack: the family and the priesthood. Jesus, our High Priest, through his own earthly family, demonstrates the importance of the “traditional” family to the world. Thus, families must come to see the impact their influence has on society for the good of all – and rise up to this challenge. Activity: Today, gather the members of your family together and consecrate your family to the protection of the God with a special blessing during today's worship! * Thank you to The Cathedral of St. Mary for this devotion. 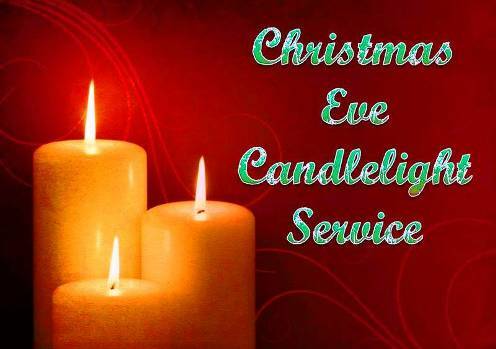 Christmas Eve--Monday December 24 at 7:00 p.m.
Begins 7:00 p.m. Ends 8:00 p.m.
Christmas Eve Candle Light Nativity Festival Service 7:00 p.m.
and experiencing the presence of God in holy communion. From 1990-2000, I was part of the Association of Vineyard Churches. In my years as a pioneer pastor or church planter, I studied the teachings of our leader John Wimber designed to build a movement of church pioneers. The first generation of a new move of God begins with pioneers. In The Charismatic Episcopal Church, we are still in the pioneer phase, as is St. Patrick's Church. Every time I see God lead a person to our church, I know they will only stay if they have the strength and calling to be pioneers. 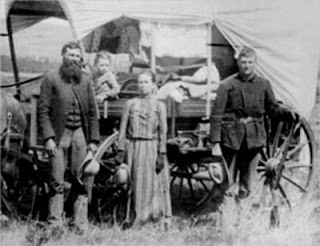 Looking back at America's westward expansion, pioneers left the established cities of the east coast, and took huge risks to go to new places, clear a spot of land, contend with many dangers, and build a dream. That is the kind of life visionary pioneers lead. As in settling the frontier, new church pioneers give up the comfort and security of the settled, established church with its mature buildings and programs to build a vision God has placed in their heart. Every time a person stays at St. Patrick's, I know God has sent us a pioneer to help us build. Below, I am excerpting a piece by Tri Robinson "Building a Settlement While Retaining the Pioneer Spirit That Birthed It." Read it thinking about understanding that St. Patrick's is a pioneer church. Be blessed! A move of God begins with the courageous, entrepreneurial efforts of a group of people who have gone out into the world believing God for the impossible. In this way they act like the early pioneers that once forged out a new life where there was nothing. They were driven by fresh vision, creativity, innovative ideas and the willingness to take major risks. They were motivated by a compelling dream of what could be rather than being satisfied with the status quo of what was. Pioneers forge into unknown territories with a hope of a preferred future as their guide more than a well thought out organizational plan. Like the pilgrims who landed at Plymouth Rock with nothing but faith in God and a dream for a new beginning, pioneers resist the restraints of bureaucracy desiring the freedom to be lead by the Holy Spirit and simple Biblical values rather than top down, authoritative, centralized structures. Pioneers build pioneer towns, towns with minimal structure systems. They build only what is necessary to facilitate the immediate needs before them. Pioneers govern themselves, not so much because they are given titles and assigned positions of authority, but rather out of natural gifting and necessary functional roles. There is no mayor, no chief of police, no town council. There is no need; not at first anyway. As the settlement progresses new folks move in. These newcomers are different than the original pioneers; they come at first for the excitement of the pioneer life but desire more security and less risk. They perceive the free- flowing lifestyle of those that came before them as being disorganized and somewhat reckless. They value and strive for management and organization. They want schools for their children, law enforcement to maintain order, rules and regulations to define what’s acceptable and what’s not acceptable. Little by little the feeling of adventurous freedom and the creative entrepreneurial spirit that originally birthed the settlement dissipates under the restrains of increased polity. Pioneers solve problems as they arise, one at a time; settlers establish rules and write neighborhood covenants in hopes of avoiding conflict altogether. Polity subtly replaces vision as it is used to define the culturally current social direction. Ideology replaces missionality as ideas and thinking becomes a higher value than spontaneous action. In reality this is an honest scenario for most growing human organizations. For true pioneers however, it is a sad reality that feels futile and hopelessly unavoidable. Or is it? Could there be a means of growing a viable organization without the encroachment and confinement of institutionalization? Could we build a lasting vibrant settlement, or in our case a church movement, that maintains the pioneer spirit? I think we can. On Sunday December 9, come hear Fr. Terry Gensemer, an itinerant evangelist who travels all over the world preaching the Gospel of Jesus the Life. On December 8, Fr. 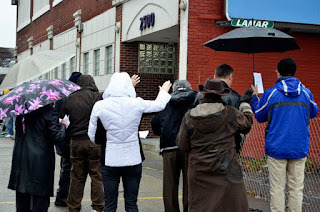 Terry led a prayer vigil at Buffalo Women's Services, one of two locations in Erie County that performs abortions. An ecumenical group from St. Patrick's CEC, Roman Catholic, and Protestant Churches prayed for the dignity of the lives of babies whose lives in the womb are terminated at that location.